Deep Fisheye View. You will see numerous circular photos in this gallery. I took them using the new Canon 8-15mm circular fisheye lens, which takes a 180-degree photo in all directions (i.e., from straight up to straight down, and side to side). 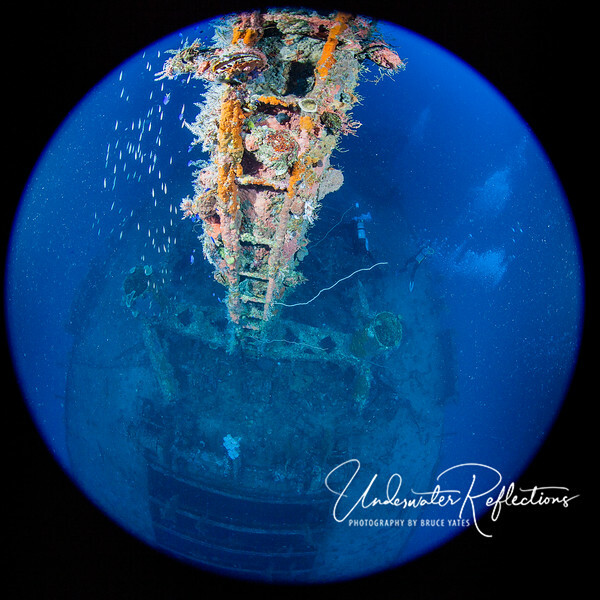 This shot is looking down on the wreck of the San Francisco Maru. This was the deepest dive of the trip (165-185 feet, depending on where you went), so we could only spend a few minutes down there, but I wish we could have dived it more than once!